Timothy Time – the clock that rocks – and musical friends Kuku and Digi will have your kids reading watches and clocks in no time. 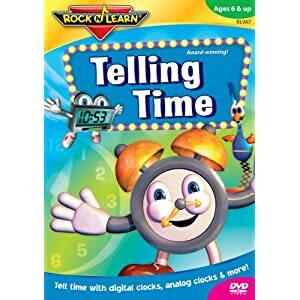 This high-energy DVD teaches children how to tell time using traditional analog clocks with hands as well as digital ones. Cool music, catchy rhymes, and colorful animated action keep kids focused on learning how to tell time. Ages 6 & up. Approx. 46 minutes. Telling Time starts off easy and gives clear examples along with lots of humor and musical entertainment. Kids learn to tell time to the half hour, quarter hour, five minutes, and eventually to the minute. We've provided plenty of practice so that students build their skills every time this program is used. As a bonus, we've included days of the week, months of the year, and how calendars work. Telling time is not an easy concept to master, especially for younger kids. This DVD takes this sometimes confusing concept and makes it that much simpler. Through the use of music and repetition, kids are taken on an adventure where they can rock along with Timothy Time. For me, not only did I enjoy seeing my own kids learning as they watched the DVD, I also enjoyed seeing how they broke down the concepts into manageable parts, making it that much easier to understand for the viewer. No more boring lessons, this DVD rocks along with the music to make learning fun!